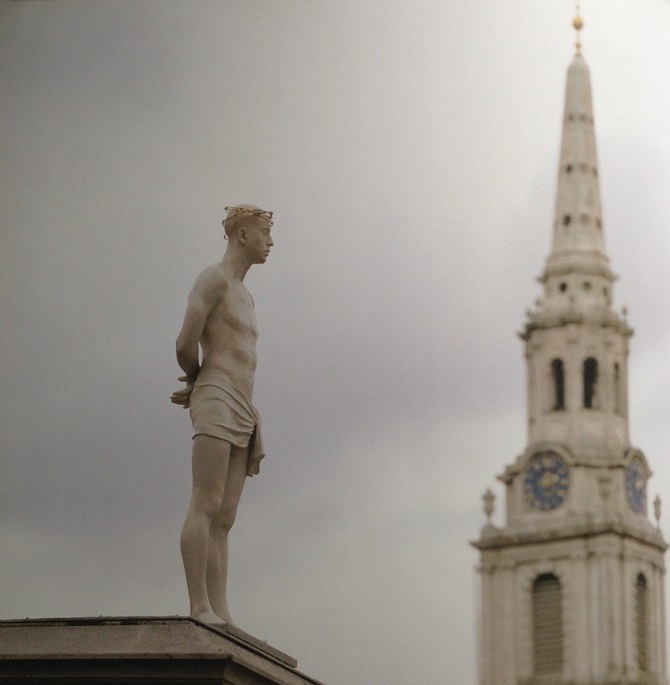 Mark Wallinger’s Ecce Homo has been shown in various contexts, but its origin was as a site-specific installation for the famous Fourth Plinth in London’s Trafalgar Square, the first in the series of works by different artists that has occupied that space. Invited to make the work in 1999 as a ‘Millennium project’, Wallinger originally understood that his work might occupy the plinth in perpetuity. Subsequently the plan emerged to exhibit a new work there every 18 months or so. But nothing, in my view, has subsequently matched up to the power of this work. How wonderful it would have been if Wallinger’s understanding had been correct. Ecce Homo is a life-size figure of a man, cast in a sanded polyester resin, which has the whiteness of marble but is more resilient in the face of the British weather. Its whiteness sets it in contrast to the black bronze of the other sculptures in the square and suggests the innocence of the victim. His hands are bound behind his back. As such he can stand for all the suffering and mistreated of the world. But the crown, created in modern-day barbed wire rather than thorns, identifies him as Jesus, bound and flogged, now presented by Pilate to the crowds. When Trafalgar Square was first laid out in 1840s the plinths in three corners were quickly filled by sculptures of King George IV on horseback and two military commanders from Britain’s Indian Empire, General Charles Napier and Major-General Henry Havelock. The fourth plinth was intended for a figure of another king, William IV, but the money ran out and for 150 years the plinth stood empty, before the current policy of temporary installations was started. 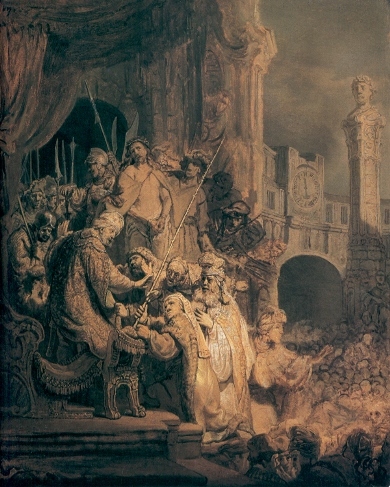 When Rembrandt painted his Ecce Homo (1634, London: National Gallery) he invented a huge column with the bust of Caesar (at the right), casting Jesus and Caesar in similar poses, so one could draw the comparison between worldly power and glory – enshrined in stone but ultimately transient – and spiritual power and glory, enshrined in the flesh of the eternal God-man. Wallinger does not have to invent the context: the other sculptures in the square create it for him. The bombastic depictions of military power and empire are rendered hollow by the quiet presence of the physically vulnerable but all-powerful God-man. Wallinger describes himself as a former atheist, now an agnostic. To him the figure of Jesus expresses sympathy with those unjustly suffering. He said at the time of the original exhibition that he wanted to emphasize the humanity of Jesus, ‘a guy being handed over to a lynch mob. I wanted something that reflected back on issues to do with power.’ Jesus is presented as an oppressed individual, symbolic of the many millions who suffer at the hands of unjust and corrupt powers. However, the Ecce Homo scene is just one episode in a full drama. Jesus does not stop at expressing sympathy for the poor and the oppressed: he comes to set them free through the path of weakness and self-sacrifice on the cross. Jesus is in the process of achieving the greatest victory in the history of the world, far greater than those that built Britain’s great but passing empire. This, not thrones or armies, is the true power at work in the world. As we look at Ecce Homo we can also remember the wonderful irony of what Pilate says. ‘Ecce homo’ is the Latin translation of what Pilate says as he displays Jesus to the crowd: ‘Behold the man.’ These words invite the crowds to see how weak the tortured figure of Jesus is and to question why they are so vehemently opposed to him. But Pilate also unwittingly points to another truth: Jesus is ‘the man’, the true man, more wonderfully and perfectly human than any of us, the model for all humanity. And he is so in the midst of his weakness and suffering, not in spite of it. Just as Pilate presented Jesus to the crowds, so Wallinger presents him in Trafalgar Square, which is often the scene of chanting crowds and demonstrations. How wonderful it would have been to have permanently at the centre of the city this understated but vivid reminder of an alternative power, another way to win, through loving self-sacrifice for others. Mark Wallinger: Ecce Homo, 1999, polyester resin, life-size. To read what Laurel Gasque wrote about Rocking Horse Boy by Elmgreen and Dragset that was on the same plinth for the London Olympics in 2012, click here.